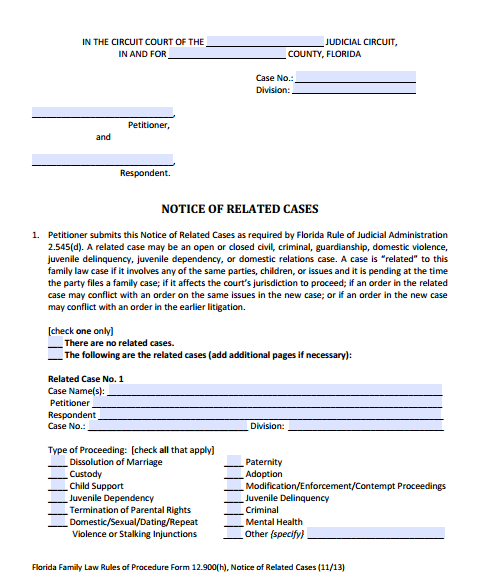 PDF Fillable Form 12.900(h) Notice of Related Cases. Florida Rule of Judicial Administration 2.545(d) requires the petitioner in a family law case to file with the court a notice of related cases, if any. Your circuit may also require this form to be filed even if there are no related cases. an order in the new case may conflict with an order in the earlier case. This form is used to provide the required notice to the court.